Defender Calmag - Kenya Biologics Ltd.
DEFENDER CALMAG is a concentrated solution of calcium and magnesium, which is especially formulated to prevent and correct deficiencies of such elements in all types of crops. DEFENDER CALMAG contains free L-amino acids to improve the mobility and accumulation of nutrients within plant tissues. DEFENDER CALMAG is used as a source of calcium and magnesium in plant nutrition programs. The application of this product prevents and corrects calcium deficiencies aggravated by slight deficiencies of magnesium and boron. The L-amino acids act as chelating agents and simultaneously favor foliar absorption of nutrients and also their root assimilation. 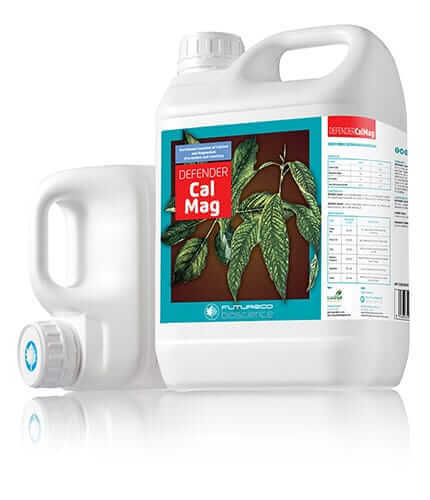 Regular foliar application of DEFENDER CALMAG prevents the effects of calcium deficiencies (apical necrosis, fruit cracking, and early maturation) and magnesium deficiencies (photosynthetic activity reduction). Crops treated with DEFENDER CALMAG have better vegetative growth and higher harvest yields. DEFENDER CALMAG is recommended for prevention and correction of calcium and magnesium deficiencies as well as stimulation of vegetative growth. Apply using enough water to completely wet all foliage. DEFENDER CALMAG can be used in dissolved in drip irrigation water. DEFENDER CALMAG is stable for at least three years since manufacturing date. Store in the closed original container in a cool and ventilated area. DO NOT store for prolonged periods in direct sunlight. Keep away from food, drink and animal feed. Keep out of the reach of children. Water soluble calcium (CaO) at 5.0% by massStandard aminogram and bio-stimulant compound determination by standard means. Amino acids (w/w %): 2.0% glycine and 0.4% lysine. Compounds with phytohormonal activity (ppm): 15ppm gibberellins, 5ppm auxins, 5ppm cytokinin, 10ppm vitamins and 10ppm bioflavonoids. Horticultural 300 – 400 Apply 3 or 4 times at two weeks intervals since 15 days post-transplantation. Grapevine and kiwi 200 – 300 Apply since 20 cm buds every 15 days (minimum 3 applications). Pome and stone fruits 200 – 300 Apply since newly formed fruits until colour change. Pome fruits 250 – 350 Start applications in newly formed fruits, applying at 15 days intervals. Citrics 300 Apply during bud growth during spring and fall. Blueberry, raspberry, strawberry 200 – 300 Apply since budding until harvest at 15 days intervals. Potato 300 – 400 Start applications 30 days after emergence to improve photosynthesis.